Now that IKEA has abolished plastic shopping bags in favor of reusable ones, some folks might have amassed more than their share of big blue bags. If that sounds like you, here’s a fun tip from reader Paul Mattingly on how to upcycle four of the Swedish carryalls into a sporty and conversation-starting raincoat. 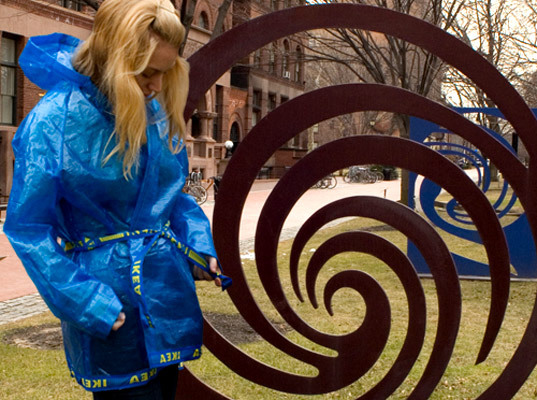 “The IKEA Raincoat is a thrifty and intelligent idea for keeping dry in the rain,” he tells us. We couldn’t have said it better ourselves, Paul! Now that IKEA has abolished plastic shopping bags in favor of reusable ones, some folks might have amassed more than their share of big blue bags. If that sounds like you, here's a fun tip from reader Paul Mattingly on how to upcycle four of the Swedish carryalls into a sporty and conversation-starting raincoat. "The IKEA Raincoat is a thrifty and intelligent idea for keeping dry in the rain," he tells us. We couldn't have said it better ourselves, Paul!